Shelterrific blogged about where to shop in New York City's Tribeca the other day, did you happen to read that? 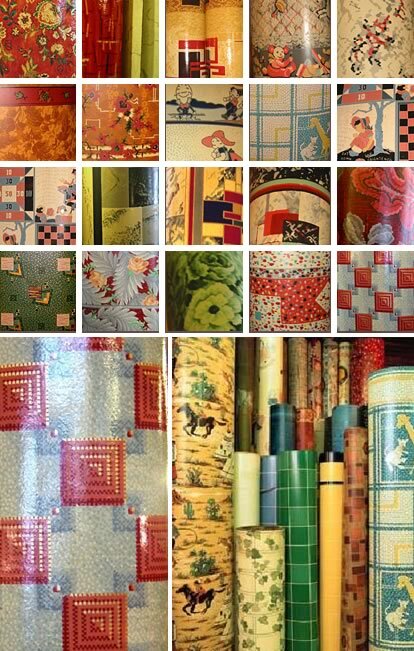 Mentioned in the post was a real gem of a place called Secondhand Rose, they claim to stock the largest collection of vintage wallpaper in the world - over 1,000 patterns! Next time I'm in NYC, this place is a definite stop for me. I'm so happy that Shelterrific blogged about them! As I browsed Secondhand Rose, my knees weakened when I learned that they also stock vintage linoleum. It's not exactly trendy or slick, but I'm absolutely crazy about vintage lineoleum flooring anyway. It's so rare, quirky, a bit tacky, but overall - utterly charming. Aside from being known as "40 year flooring" due to its durability, vintage linoleum is art in itself, very colorful, not as serious as modern linoleum in it's typical neutral patterns. 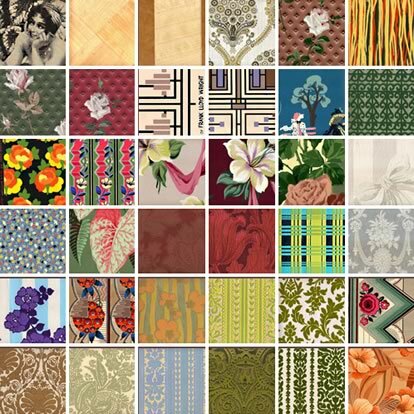 In fact, I'd love to see someone develop a modern take on vintage linoleum. Patterns that are just as bright and bold, but a more current take. If I had a summer home, I'd definitely consider installing some in a bathroom or kitchen. I love this geometric pattern in blue and red, I can totally picture it an all white kitchen with sky blue walls, white molding, and a shiny fire engine red toaster with a stack of mixing bowls on the counter to match. So...Vintage linoleum - Your thoughts?